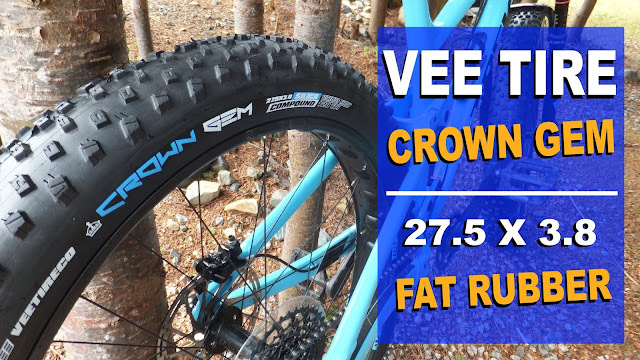 A recent crash and resulting trip to the hospital got me thinking about personal fatbike safety and I shared my thoughts in my blog post Fatbiking Safety | The Unexpected Crash. 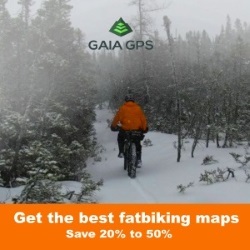 The most important piece of safety equipment that you can wear while fatbiking is a helmet. You go into any LBS or search on-line and you will find a plethora of skid lids to protect your brain from unintentional impacts. 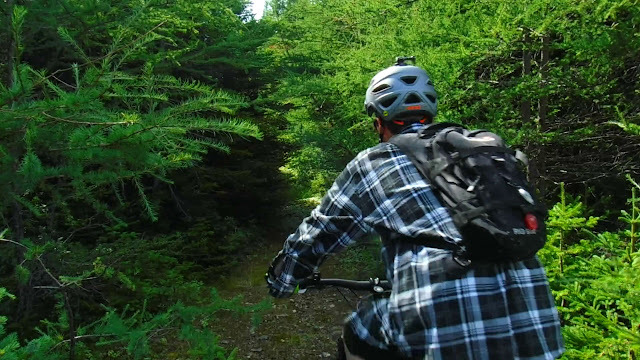 Many helmets spout different types of technology, manufacturing techniques, and improved safety features. And prices can range from quite affordable to crazy expensive. 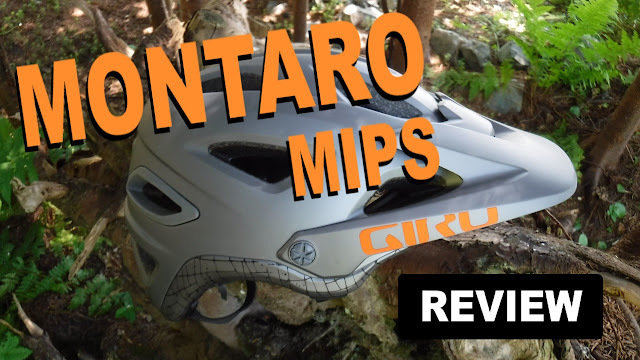 As a result of my experience I reached out to the good folks at Giro and they sent along a MIPS equipped Montaro for review here on Fatbike Republic. When purchasing a helmet, the main goal is to protect your head and the gray matter inside. Impacts can be from branches infringing on the trail to full on OTB situations. In this respect, helmets are like an insurance policy where you hope you never have to collect. Many LBS carry a good selection of low-mid priced helmets in a handful of popular colors that will protect your noggin. However, helmets generally get more expensive the nicer they look and the more features they tout. So the balancing of aesthetics, price and features can be an issue at times. It's highly recommended that you actually try on a helmet before you buy it. This is to ensure sizing and comfort. It seems that each manufacturer has a slightly different sizing chart and method for the perfect placement of the foam padding. It is entirely possibly that a more expensive “flashier” helmet will not fit you as well and not feel as comfortable as a less expensive one. There is nothing more irritating than an uncomfortable helmet on a long ride. 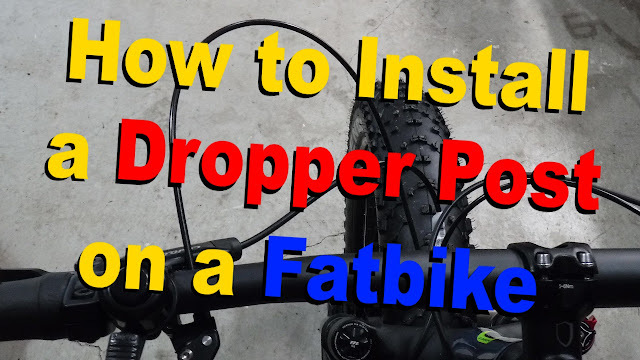 As fatbikes are a four season deal, you should also remember the need for a little extra room for a hat or balaclava to stave off the winter cold. And if you happen to be looking for more information on bike helmets check out www.helmets.org. 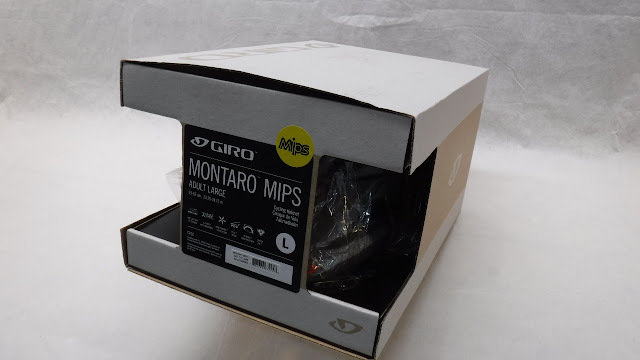 This is what the folks at Giro have to say about the Montaro MIPS . MIPS (Multi-directional Impact Protection System) - This helmet technology is designed to reduce rotational forces from certain types of helmet impacts. Learn more about MIPS in this video. P.O.V. PLUS – Allows you raise the visor and place your goggles (if you wear goggles) on the front of the helmet. HYDROPHILIC PADDING – This padding helps to manage your sweat while riding by absorbing up to 10 times its weight in water. In addition, the X-Static antimicrobial lining helps to reduce odor. 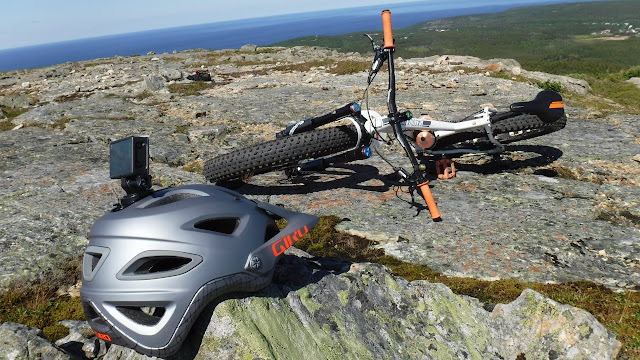 FULL CAMERA MOUNT INTEGRATION – A plastic helmet insert allows the mounting of “GoPro” style cameras without the need for aftermarket mounts. 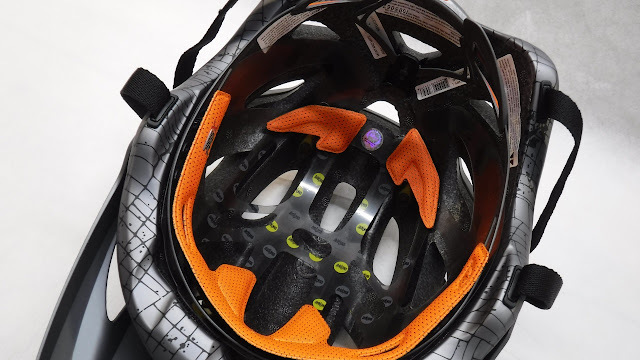 ROC LOC AIR FIT SYSTEM – This patented technology actually keeps the helmet suspended slightly above your head and allows for increased airflow. 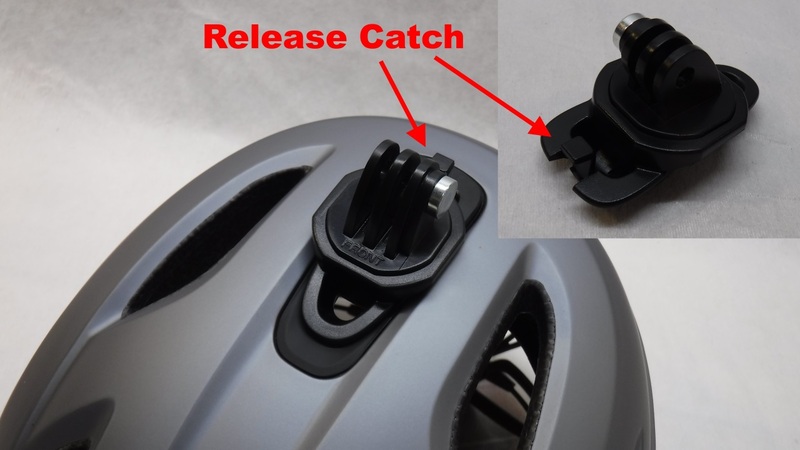 The single knob adjuster allows you to custom fit the helmet in seconds with one hand. ROLL CAGE REINFORCEMENT – A web, moulded inside the helmet’s EPS foam liner helps the helmet to hold together under impact, and provides an extra measure of strength and integrity. 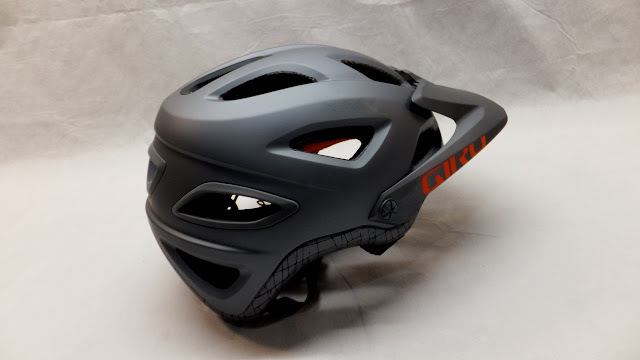 The Montaro MIPS is a new helmet for 2017 from the folks over at Giro. Reviewing the list of features and MSRP ($150) I would consider it a mid-high range bike helmet. It arrived in an industry standard two piece box with instruction booklet, action camera attachment and descriptive tags attached to the helmet. 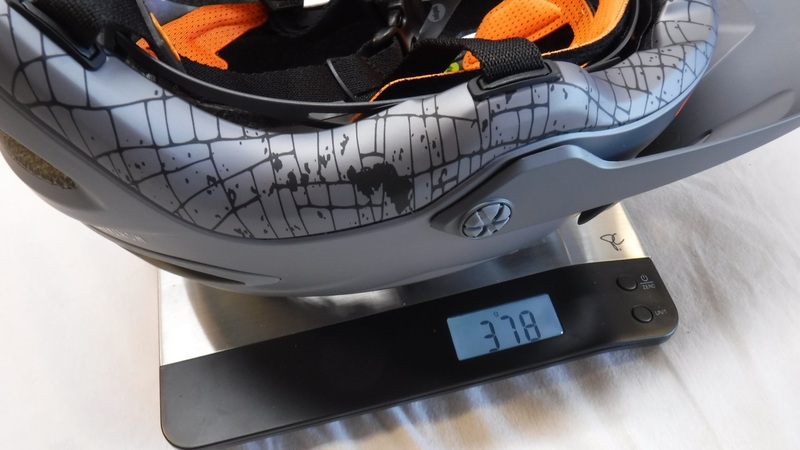 Dropping the Montaro on the sales the size large weighs in at 378g. This is pretty much in the same ballpark as the other low-mid range helmets in my inventory. The advanced technology does not appear to add any additional weight. The color I received is called Matte Titanium/Flame . . . there are actually seven colors to choose from. The Montaro MIPS is also one sharp looking helmet with its proportionally sized visor, sharp color scheme and plenty of well placed vents . . . 16 to be exact. Things start to get really interesting when you turn over the helmet and get a peek inside. The suspended "lattice" is the heart of the Roc Loc Air Fit System, which is complimented by strategically placed padding to ensure that your cranium is well protected. So the moment of truth . . . how does it fit? I used the sizing chart and instructions on the Giro site to select the appropriate size. Dropping the Montaro MIPS on my head, adjusting the “lattice” with the rear button and tightening the chin strap . . . it fit like a glove. The helmet actually felt like it was floating above my head with zero points of contact. This was the MOST comfortable helmet that I have ever strapped to my head. Over the years I have tried on many different styles, brands and price points and there has always been something that did not feel right. Not so with the Montaro MIPS. Before I hit the trail I installed the supplied action camera mount. This plastic insert, formed to fit in the upper rear vent, is designed to fit ‘GoPro” styled camera mounts. I did find that the insert was a little finicky when first installing as there was no mating plastic sleeve for the insert to slide into. The insert is held in place by the release catch that rests inside the helmet foam and grips the helmet shell. There were no issues with fitment after the initial install. So how does the Montaro MIPS feel on the trail . . . one word . . . amazing! 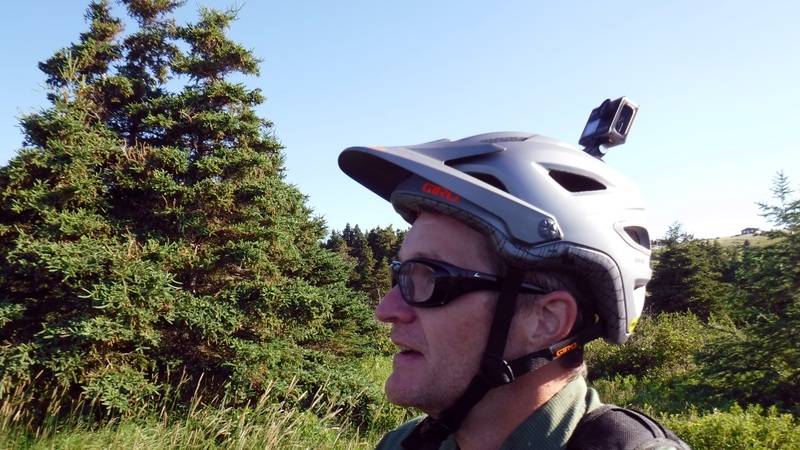 It does not matter if you are taking a quick spin down the trail or a full-day excursion, the Montaro MIPS was super comfortable. It felt like I was not even wearing a helmet. The vents kept my head cool during short and long climbs and while doing extended gravel grinds. And the anti-microbial treatment did seem to work as I did not get any of that funky helmet smell after multiple sweaty uses. The action camera insert did not move and it held the SJ6 Legend in place during all sorts of vigorous fatbiking activity. And while not tested in winter mode, there is plenty of room to wear my favorite balaclava when it gets cold. Did I have the opportunity to actually test the Montaro MIPS in any crash situations? Thankfully no . . . crashing once is enough for me. But based on the extensive testing that Giro does on its helmets I trust that it will do its intended job when then time arrives. Since receiving this helmet for review, the other helmets in my inventory have been collecting dust. The Roc Loc Air Fit System and padding placement make this one comfortable helmet. I also find the integrated camera mount very convenient. And the MIPS system is an extra level of protection that I hope I will never have to use. Giro have certainly brought their A game when designing this helmet. Be sure to check out the Montaro MIPS next time you are looking for a new bucket to wear on your fatbiking adventures. 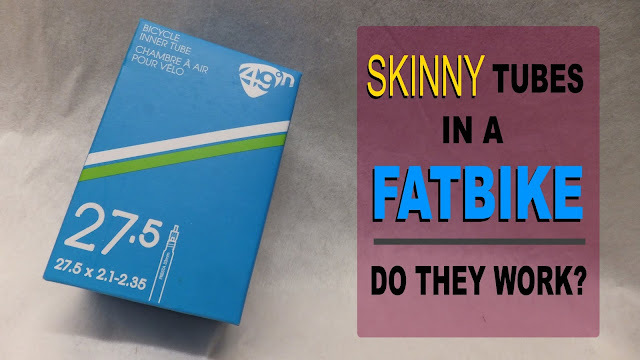 Stay tuned as Fatbike Republic also takes a closer look at the convertible Giro Switchblade. 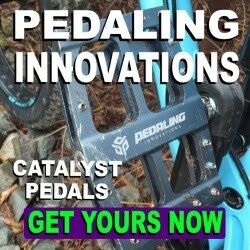 Great info, love the mountain bike helmet reviews! 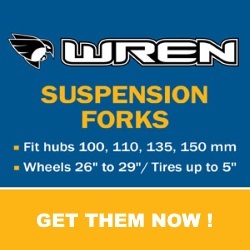 Always a necessary gear to invest when going cycling or mountain biking.